The beginning of this school year introduced a new element to the St. John’s School. 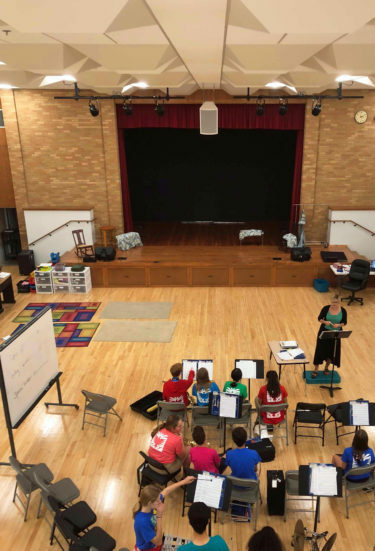 For the first time, they now have a Performing Arts Center. With the addition of the new Gym last year, this provided an opportunity to convert the old gym into a new performance space. Kelly Hockey has been leading this final phase of the St. John’s project to completion. The new space has an extended stage, a new media room, many acoustical improvements, a new sound system, and additional theatrical lighting. The old gym floor was sanded to remove the sports graphics, then refinished to provide a new look. This space will be used as a learning space as well as a performance space for the St. John’s students. This completes the third and final phase of the St. John’s project. The renovations of the Parrish offices and the new 9,000 square foot gym were completed in the earlier phases. Our thanks to Fr. Jeff Ernst, Principal Pat Newton, and to all the staff at St. Johns for their support and patience during the construction project.